Keep tabs on every device that’s logged in to your admin. Forgot to log out of a public computer or see a device you don’t recognize? Use this feature to force a log out. If you see devices you don’t recognize, we’d recommend changing your password to keep things safe. Make it a regular habit to check your devices to be sure your shop stays secure. Scroll down to Active devices. 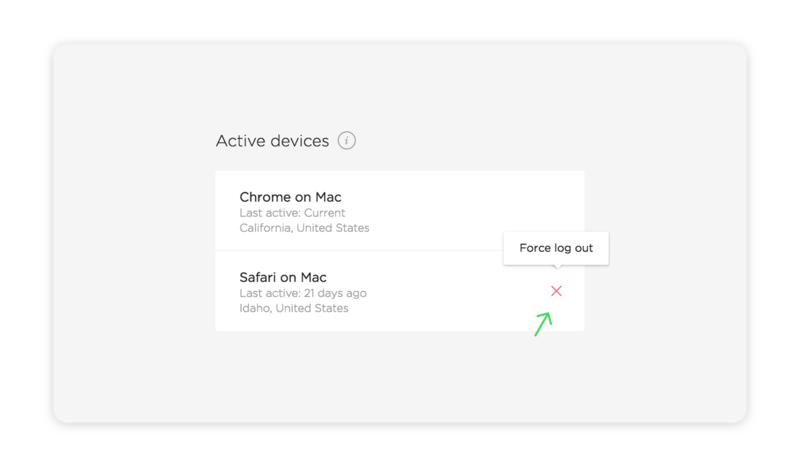 If you see a device that’s not yours, hover over it and click the grey X to force a log out. Tap your account image in the top left corner. If you see a device that’s not yours, hover over it and tap the grey X to force a log out.